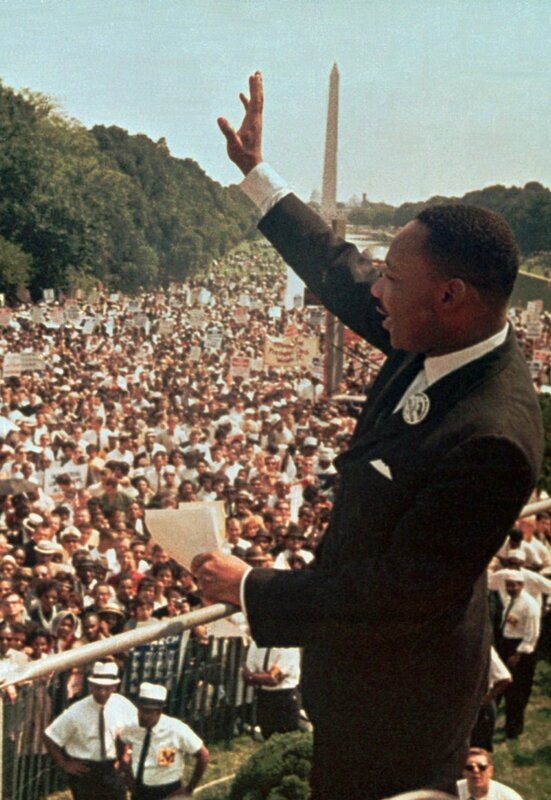 Civil rights leader and martyr Martin Luther King, Jr. is shown here in Washington, DC during his legendary “I Have A Dream” speech to over 200,000 people rallied for passage of the Civil Rights Act. The law created the legal protections for all Americans to vote, own property, and move freely throughout the public spaces in society. Dr. King’s pacifist approach is immortalized in this speech, known for the single soaring refrain, “I Have A Dream” that lifted King’s message to become one of the most widely known speeches in American history. Associated Press, Frankfurt/Main, August 28, 1963. Accessed 8 July 2010. Reference “I Have A Dream” Associated Press. “I Have A Dream” Associated Press.